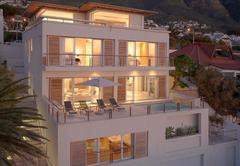 Blue Views Terrace is a property providing self catering in Bakoven for up to 14 guests visiting the Atlantic Seaboard region. 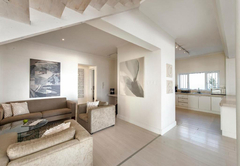 Boasting stunning views of the Atlantic Ocean, Blue Views Terrace offers self catering accommodation for up to 14 guests. 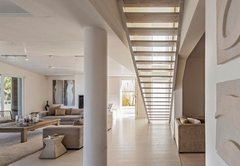 This property is only 100 meters from the Bakoven beaches and less than 1km from Camps Bay. Here you are near to various attractions and activities in the area. 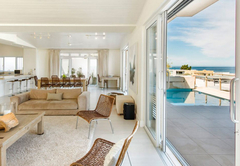 Blue Views Terrace Holiday home in Bakoven has seven bedrooms, all of which have an en-suite bathroom. 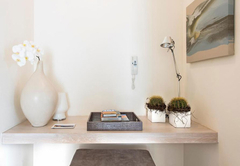 Rooms are furnished with either a King-size or single beds and all have air-conditioning. The main bedrooms have a TV and all rooms have a mini sound system. There is an open plan kitchen and living area. 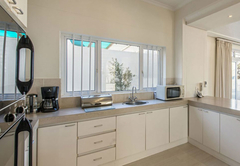 The kitchen is fully equipped for self catering and includes a washing machine, dryer and dishwasher. The lounge is comfortably furnished and includes a TV and stereo. 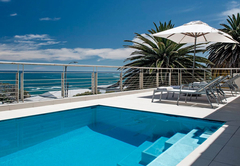 Blue Views Terrace Holiday home in Bakoven has seven bedrooms, all of which have an en-suite bathroom. Rooms are furnished with either a King-size or single beds and all have air-conditioning. The main bedrooms have a TV and all rooms have a mini sound system. Response timeBlue Views Terrace typically responds to requests in 5-10 minutes. Child policyThe house sleeps up to 14 adults and is not suitable for children.